Sense of Perspective is a circle of lights showing global birth and death rates, in 60 directions around the compass with London at the centre. Each green blink is a birth; each red blink a death. Having made a rather parochial ambient awareness gadget last year, that cheers in our kitchen whenever Arsenal score, I decided to try to take a more global outlook. My BlinkyTape had arrived (I'd funded their Kickstarter campaign) - a wonderful strip of 60 multicoloured LEDs with a built in microcontroller. The demo applications were mostly nice lighting effects, but I wanted to see if I could use it to create a visualisation to live in our house. It is based on quite a simplistic projection of the world (albeit one that is easy to understand) - there is very little happening to the north, where there is Greenland and ice, and somewhere to the south-east lies most of the world's population. Once programmed the BlinkyTape runs and runs off a USB power supply. It is showing 2013 birth and death rates averaged out into half-second slices, with all countries lying along a specific direction from London added together. For those countries that cover a larger angle, their population change is spread out accordingly. Being in the middle, the UK is excluded. The geoMap software from the giCentre at London's City University was very helpful in figuring out the countries in each direction. I used "crude" birth and death data from the UN (via Gapminder) and population data from various sources. 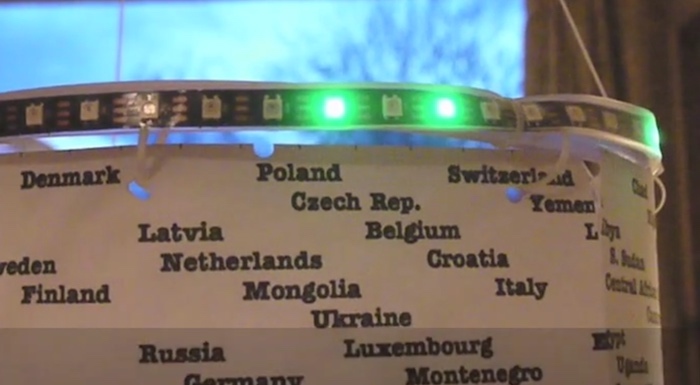 In terms of building the gadget, it turned out getting the countries printed at a scale where they'd line up with the lights was much harder than anything else. And then the fun part - lots of cable ties, transparent tubing, string and electrical tape - and you can see from the video that it is most certainly not a finished product! Sitting in our dining room, quietly blinking away, it is easy to notice just how much more green than red there is, and just how little is happening to the north or west. And in its own little way it's helping us remember how small a part of the world we are.